Happy, happy Friday my lovelies! I hope you have had a great week? I am wonderfully busy here at the moment working on a few fun projects including a bunch of new ladies for my shop shelves. If you've been following my Facebook page you'll know I've been stocking up with lots of new Forever Flower Garlands and recycled garlands. For each lovely garland I've been getting carried away with styling a perfectly co-ordinated vignette for my product shots, so much fun though! 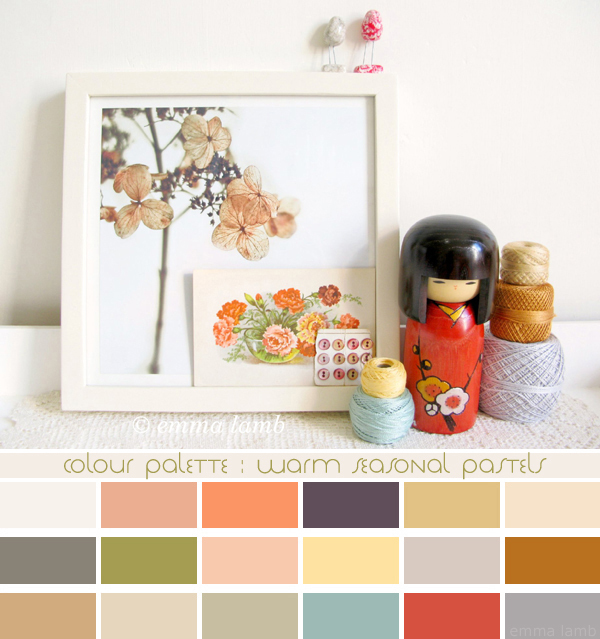 One of my favourites is this wee setup from Peggy's pictures, so what better inspiration for today's colour palette!? I love the warmth in this picture, the soft cream tones with all those autumnal pastels - salmon pink, ochre, butter yellow, duck egg blue, taupe and pigeon greys. I think what really makes this palette work is the pop of rich red, pumpkin orange and deep aubergine. They stop the pastels looking too wishy washy, to me they become intense powdery tones instead of bleached out colours. What do you think? Do you prefer the pastels with or without the 'pop' colours?